Why didn’t we cross the North Sea? We are all back home and enjoying some down time – and sleeping in our own beds. Can’t believe we have been away for only 24 days. Seems so much longer. Maybe because we have been on the go almost everyday and we had covered so much ground (and waters) and done so much. We have travelled over 9000 km – on taxis, four ferries (a lot of the time), trains (12 of them), buses, trams and one plane. When we arrived home, Mummy found the postcard we sent her amongst all the unopened Christmas cards! 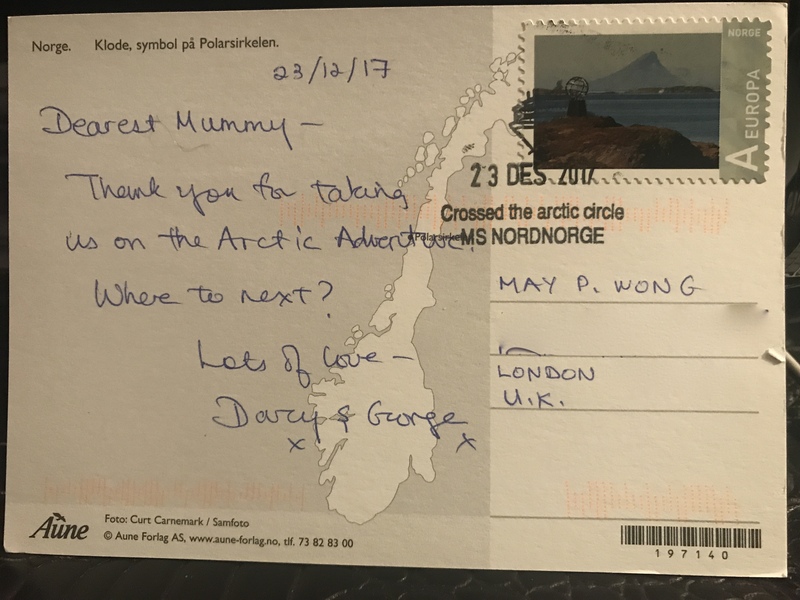 It was posted on the day we crossed the Arctic Circle – 23 December. Just wondered where and when will be our next adventure! May’s comment: The journey was long, it was arduous, it was testing and I would do it all over again – just better! LOL! Many of you asked questions about how and what and when so I thought to summarise it – and happy to answer more questions. I started the journey with three wishes – to experience Polar Nights (have already one Midnight Sun in Iceland), been dreaming of a White Christmas (a long time ago I went to Buffalo, NY to ensure I had one and then got snowed in) and more than anything to finally see the Northern Lights (the last time I tried in Svalbard it snowed all four days.) 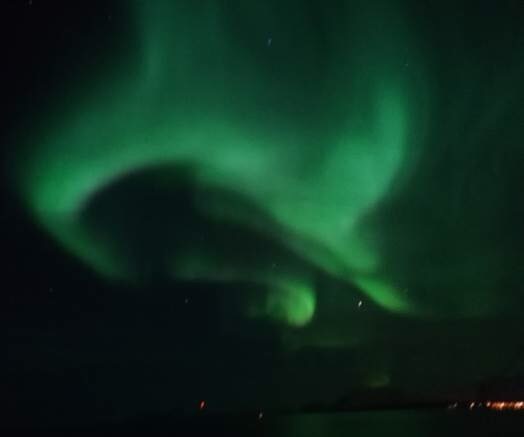 It was after all a “Northern Light Promise” cruise – and if I didn’t see it, I would had another cruise on them. I was told one needed at least five days somewhere in the Arctic to see them and I figured a twelve-day cruise might be better than chasing it on land. 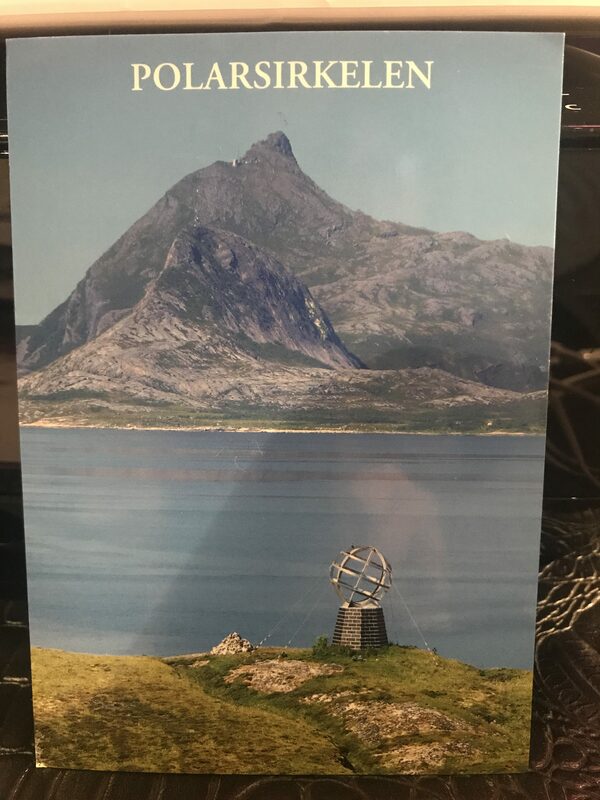 It so happened that I was thinking of doing it – just going to Tromso – the most likely place to see it, when I spoke about it to Pam and Pete while they were in London. 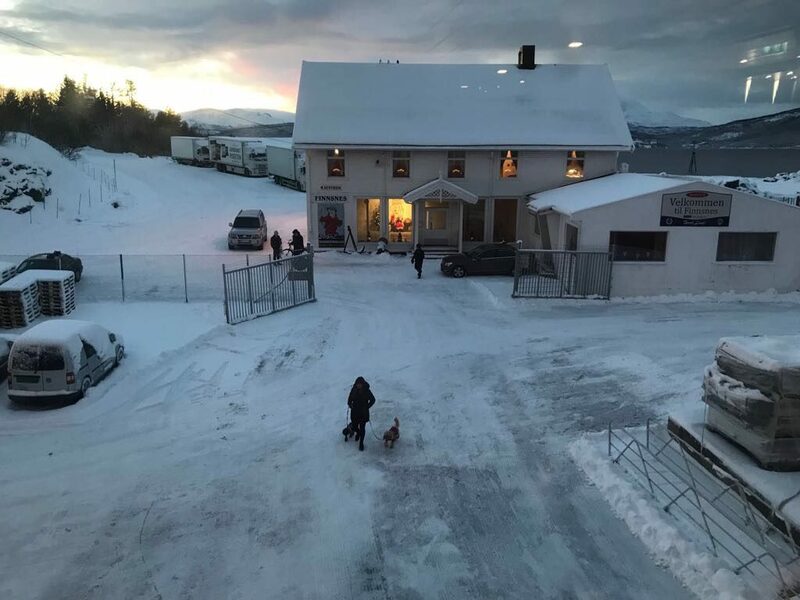 They were going on the Hurtigruten “cruise” – and it crossed my mind that maybe I could do that too. Do they take dogs? I could only ask. 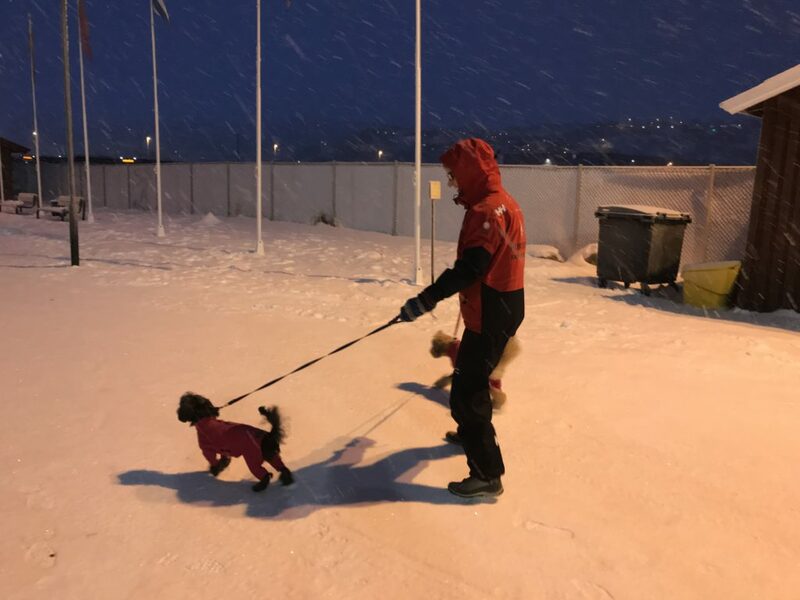 And when the person I spoke to on the phone said they were pet-friendly, I booked it immediately and then figured out later how to get us all three to Bergen, Norway! And no, I don’t think we could have crossed the North Sea from the British Isles. Besides, taking the train across the continent and crossing the bridge between Denmark and Sweden to get to the Scandinavian countries made it more of an adventure. It was also fun to re-visit those places again after so many years with my two pooches. And to meet up with friends along the way made the journey sweeter. And more than ever the Pet Passports were essential. When we visited the rest of Europe, they never checked them until we returned to the UK but upon entering Sweden and Norway, they were properly scrutinised. Learnt that “allergies” seemed to be the concern of the day and therefore we could no longer enter restaurants and shopping malls once we crossed over to Denmark, Sweden and Norway. There were allocated pet carriages on trains for that reason. 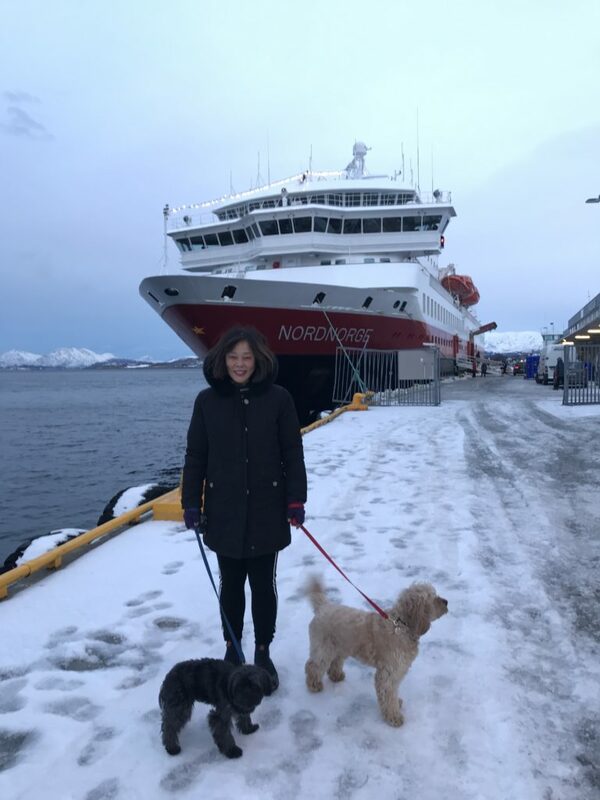 The Hurtigruten is not a “cruise ship” – it is officially a working passenger ship that carries cargo, mail and local passengers. 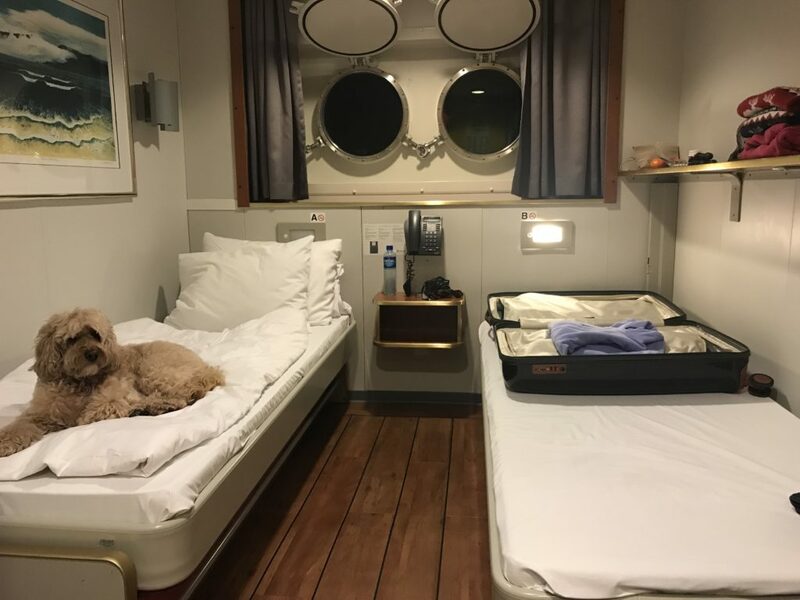 That’s why dogs were allowed on board – there were only two cabins reserved for passengers with dogs – they were not carpeted – in case of accidents, of which we had a few with George getting sick the first three days! And I was very appreciative of the linoleum floors. And I don’t think it had anything to do with sea-sickness. There was one day when the winds were strong and we were in the open seas. It wasn’t so much the ferry rocking but because the waves were beating against the potholes and they sounded like fireworks that freaked George. How did it work with the dogs on the “cruise ship”? As it was a working ship, it stopped often – sometimes just to drop off cargo or local passengers – that way, I timed it so I could take them out at least three times, if not four times each day. It was ever so slightly inconvenient to be on Deck 2 near the car deck, far from the passenger gangway on Deck 3. 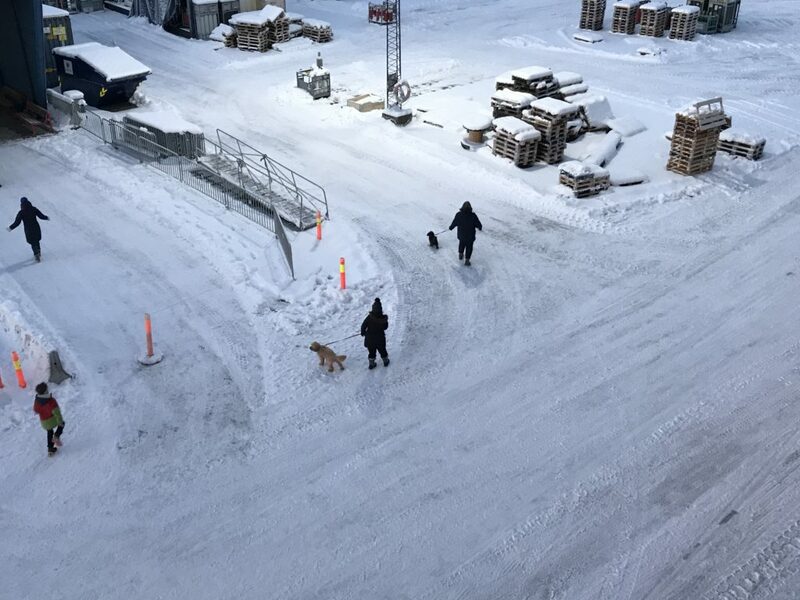 I couldn’t tell when they were opening the gangway and therefore got the dogs dressed to run out. It also meant having to get up early on certain mornings (before 6am) when they docked for 15 minutes. 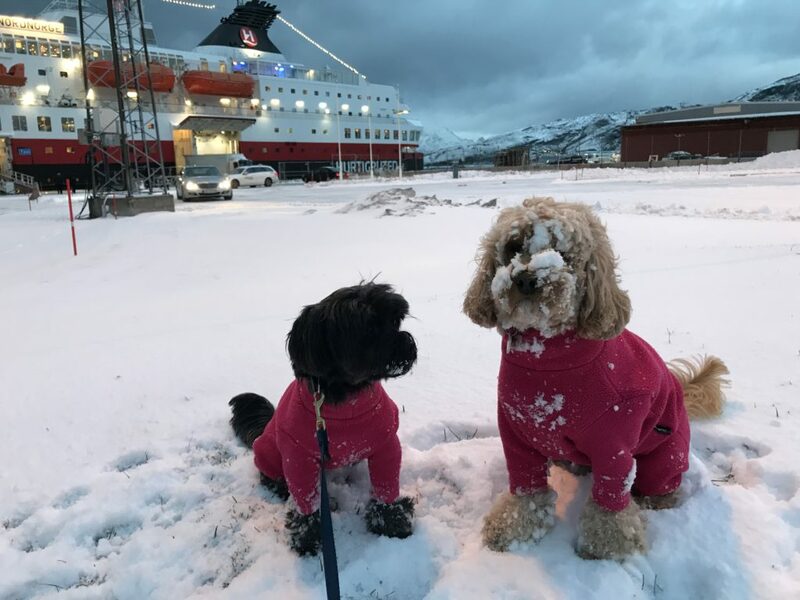 There was one morning when they did not dock as we were behind schedule, which meant Darcy and George had to wait another three hours before we arrived at the next port. That was desperation. While Darcy held, and George circled in anticipation, I could do nothing but wait. As soon as they docked, we ran out first ahead of all other passengers. And there was one evening when again they did not open the passenger gangway which meant we waited up till 12.45 am for their last walk. Soon the passengers got used to the idea that we always jumped the queue for very essential reasons. 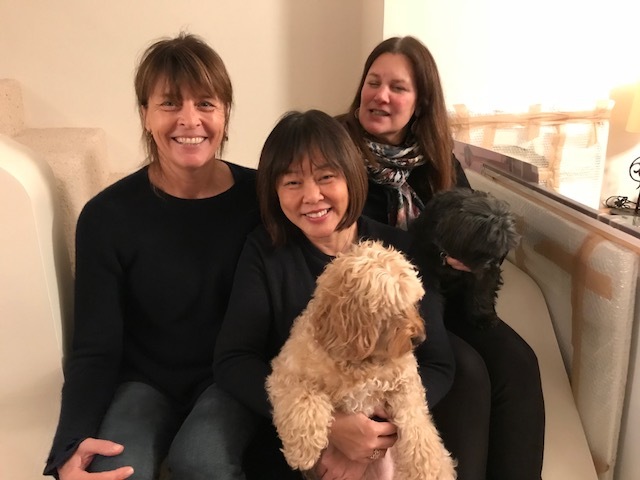 And over time, they got to know us, and we befriended some who even offered to take them for walks – thank you June, Amanda and Janneke, Victor and Patsy (if you’re reading this). When I rushed off the gangway with my two, I forget that we often had an audience. There were always passengers on the deck looking out at us. And at the beginning when George did not want to return to the ferry and went splat – he would have those watching in fits of laughter! So pleased I thought to bring their Equafleeces. Kept them dry when they decided to roll around on the snow – which they loved. The fleeces made many chuckle and we were even asked where we got them. 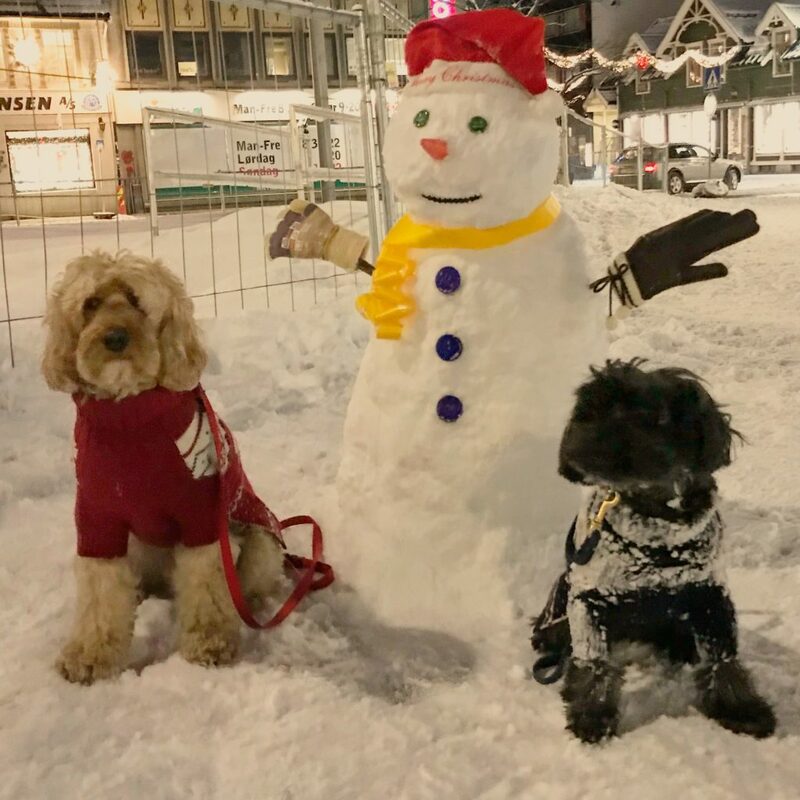 But their Christmas jumpers were a hit – I think I’ve too at least three people to go on the Purple Bone website. Feeding was a bit of an issue because we feed raw. While I managed to bring their Honey’s Real Dog Food with us for the first five days till we arrived in Copenhagen, I then resorted to asking my friend, Rachelle in Oslo to buy us minced meant for the two days we were there and extras for another two days for me to take to Bergen and the ferry. I had to store the raw meat in the fridge at Reception. After that, I resorted to packets of Lily’s wet food – which helped calm down their tummies. The raw meat wasn’t exactly Honey’s minced meat and their tummies went a little funny. And I only brought 10 packets of Lily’s – had to ration. When I saw the spread of food at the breakfast and lunch buffets, I thought one of their meals could be substituted. In my eagerness, I got them both a good portion of pork and poached salmon. The next morning, I had two dogs with the worst runny tummies and we couldn’t get off fast enough. Lesson learnt – do not give so much rich foods. So then I found them soft-boiled eggs and someone told me to crush the egg shells with them to help stabilise their runs. Of course George picked out all the egg shells or I didn’t crush them fine enough. So their breakfasts were packets of Lily’s Cottage Pie and their suppers were eggs with ham and some bread to soak them up. It also meant we ended up with some smelly farts – in a small cabin and they both insisted on sleeping with me on the single bed!!!! There was another bed they could have slept on – but no, they had to be right next to me! Both Darcy and George behaved impeccably well throughout – never once had any problems with them. The only time they barked was when there were other dogs in the cabin next to ours – and only because they barked in response. After the first couple of times when they were unsure, they soon learnt that each time I left the cabin or hotel room, I would always come back. They were not allowed anywhere else and definitely not in the restaurant, so it was essential I walked them every time there was a long stop. And each day there was at least one long stop for excursions that lasted several hours. They also learnt that when someone came into the room, it could be a positive thing. That was a necessity as I had one of the Expedition Team members to walk them when I went on excursions. The Expedition Team members were amazing in helping out. If not for them I wouldn’t have been able to go on any of the trips as they coincided with their walkies. My BIG Wheelie bag was more cumbersome than the two of them. It even had a mind of its own. 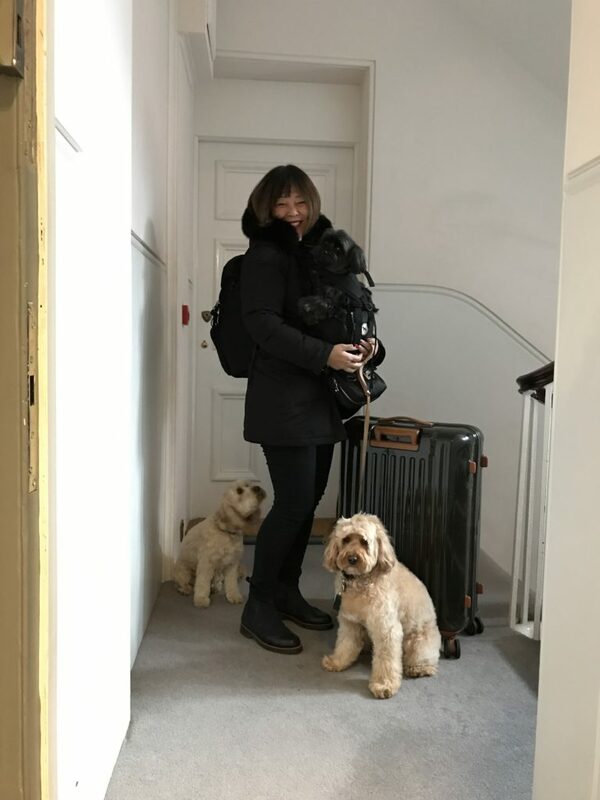 I don’t usually travel with such a big AND heavy bag but I need to be prepared for over three weeks of travel, the Arctic weather and for their flights – George needed his Sleepy Pod and I preempted all situation and brought Darcy’s tote bag. Those two items filled up a quarter of the suitcase. 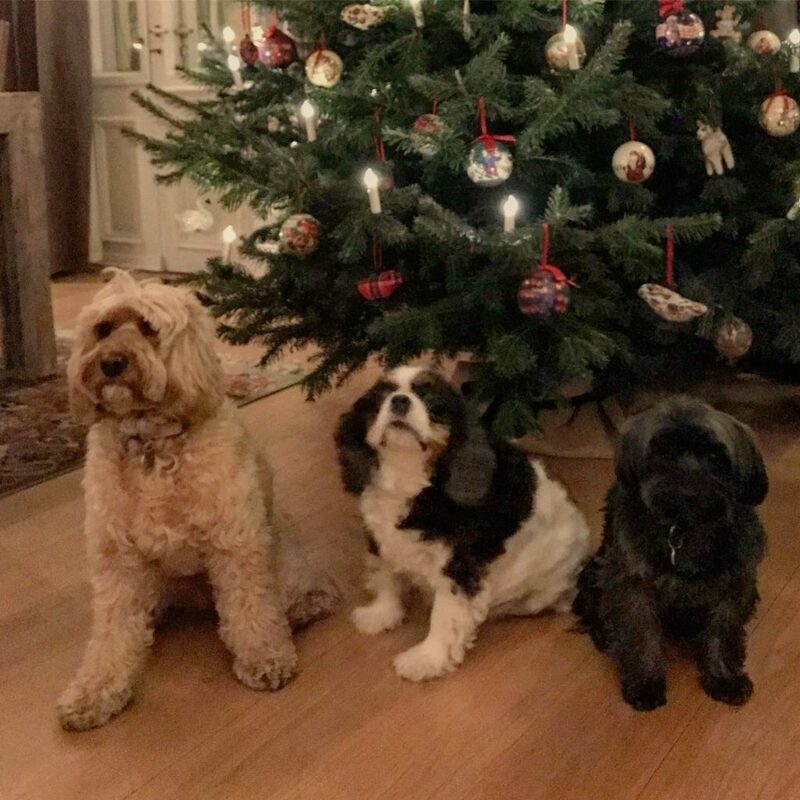 And the rest was their food, bowls, their Equafleeces, two Christmas jumpers, a tool to wipe their wet paws, bedtime treats, and accessories like snow boots which were completely useless. I spent all the time looking at their paws when we walked just in case they came off and they did. I ended up with wet boots in my pockets. Over time, we fell into a routine, or rather not a routine but learnt that there would be outside times and a lot of inside times. 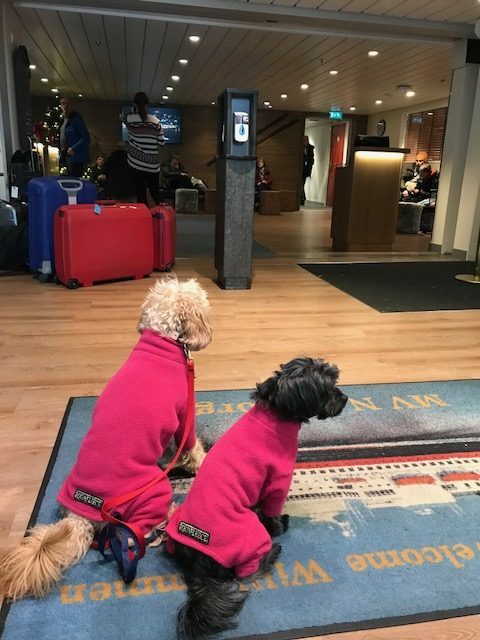 We found hotels at every stopover on the way there that were dog friendly – in Hamburg, Copenhagen, Bergen and Oslo. So all the above made sense. What was the funniest thing I brought with me? Sunglasses! Well at least it served a purpose for taking this photo. 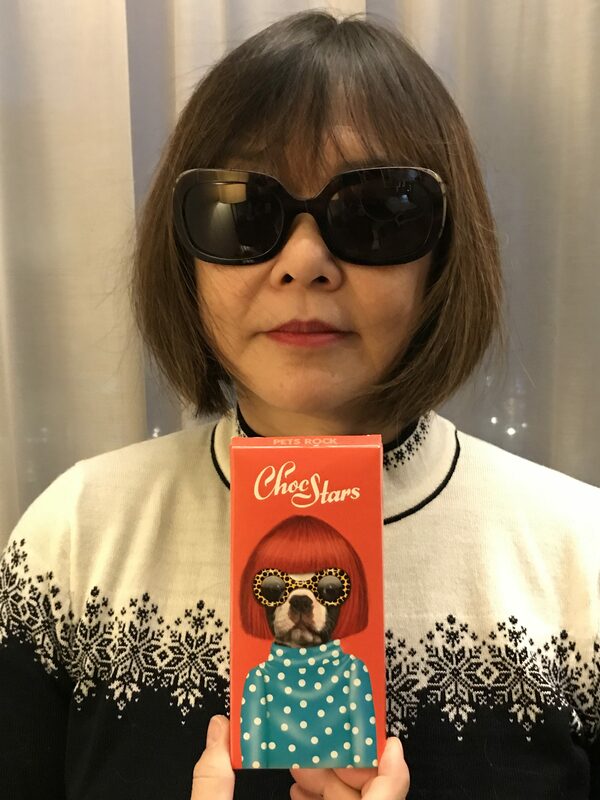 Rachelle gave me this chocolate bar – Choc Stars – they are a series of all natural German-made milk chocolate bars with fun recognizable pet portrayals on their labels. This one is supposed to be Anna Wintour! LOL! Or maybe it reminded Rachelle of me. So why did I bring my sunglasses? As one does when we go skiing, to look cool – and the sun on the snow was too bright for the eyes. I had forgotten that I was there to experience Polar Nights! There was no sun for four days! LOL! And the rest of it – was just an hour or two at most. That was a waste of space! When we started off the journey, I knew I would at least get two out of the three things I wished to happen. I knew I would for sure experience Polar Nights and we did right after we crossed the Arctic Circle. It wasn’t strange and with the ferry well lit, life was normal inside the ferry, well sort of, and we looked at the scenery outside in darkness. I knew there would be snow up there in the Arctic, and was ensured it would be a White Christmas unless global warming had caught up. But to have it snow on Christmas Day itself – that was added bonus. 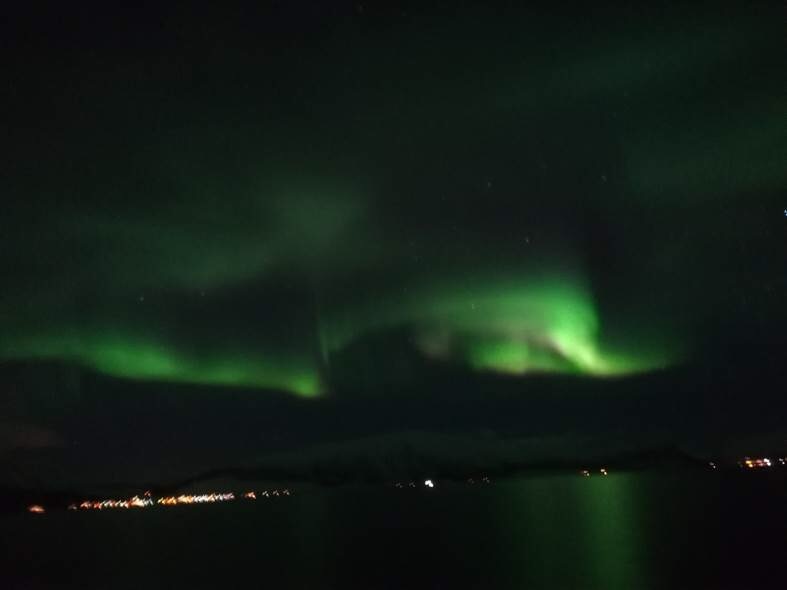 As for the Northern Lights, the first four days seemed unlikely we would see any but just before midnight on Christmas Eve, the announcement finally came – “intense lights in the skies.” We had just left Tromso – it seems the capital for Northern Lights. I ran out of my cabin with my down winter coat but didn’t think to bring gloves or a hat. And in the freezing Arctic wind, I pulled the hood over my head and braced myself to watch the ethereal lights making an appearance and watched it grow and dance in the starlit skies. I failed miserably with my Canon camera and my iPhone wasn’t loaded with a Northern Light App which I only learnt existed later. 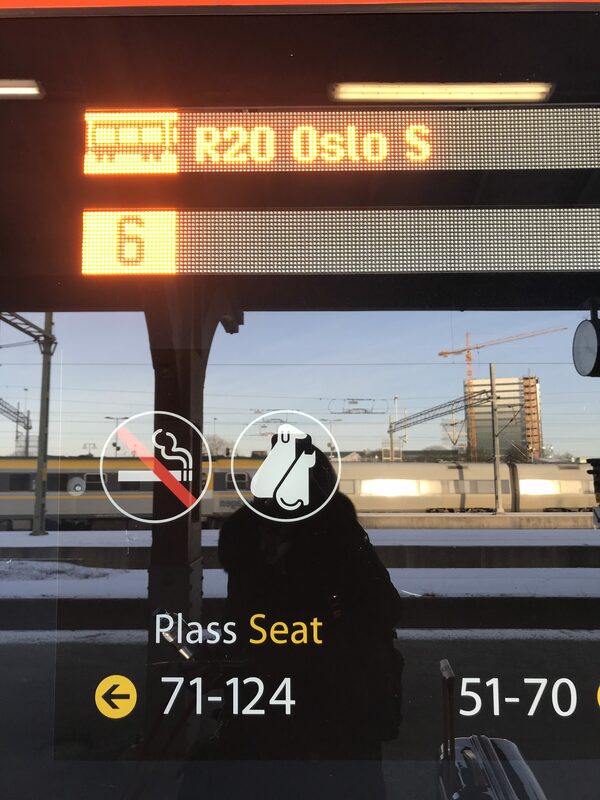 This was taken by a fellow passenger who proudly shared them – taken with his iPhone. And there they were – as beautiful as I had expected them to be – maybe less romantic after we had listened to a lecture about magnetic fields, solar energy and particles colliding. But I saw them again when on horseback, to the sound of waves washing ashore and horses hooves crunching on the snow-covered beaches of Lofoten Island. The landscape lit by a very bright half-moon, when to the right of us, the paint strokes of green swirled and streamed across the night skies – pinprick by the Big Dipper and other constellations. There were about ten of us riding in a row but we did not speak. Those moments were quietly absorbed – mine was shared with Oki, my Icelandic horse who took care of my nerves. It was magical. I didn’t want it to end but end it did – and so grateful to then start the New Year with friends. 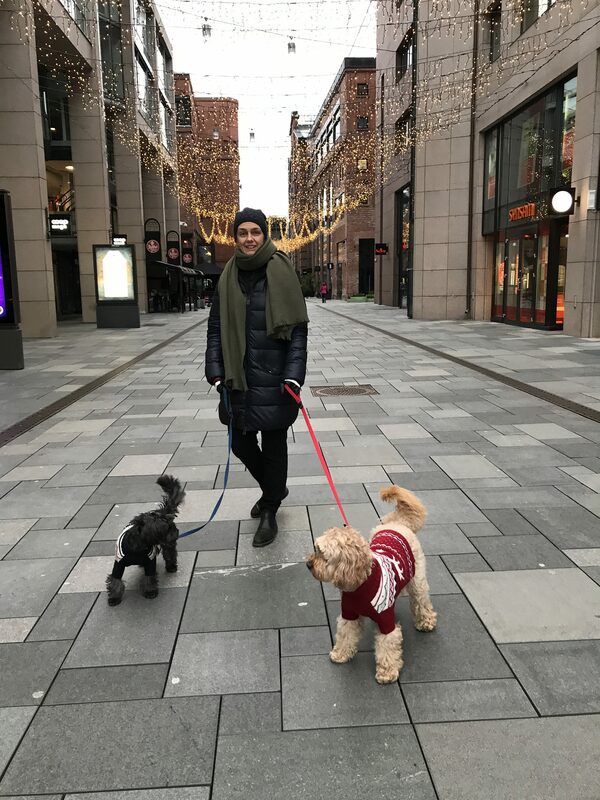 With Catarina in Oslo on New Year’s Eve … On New Year’s Day with Sylvia and Manuela in Düsseldorf Grateful to be able to dream, to have the physical strength to see it through and my pooches to share the experience with. You’ve had an amazing journey May with Darcy and George. It’s been great to follow. I’m in awe of your determination to take your two dogs and the big luggage on your own. Amazing. I enjoyed your adventures almost as much as you. And yes I still think you were brave to do all that traveling with 2 pups, albeit 2 very well behaved pups, and the big wheelie! 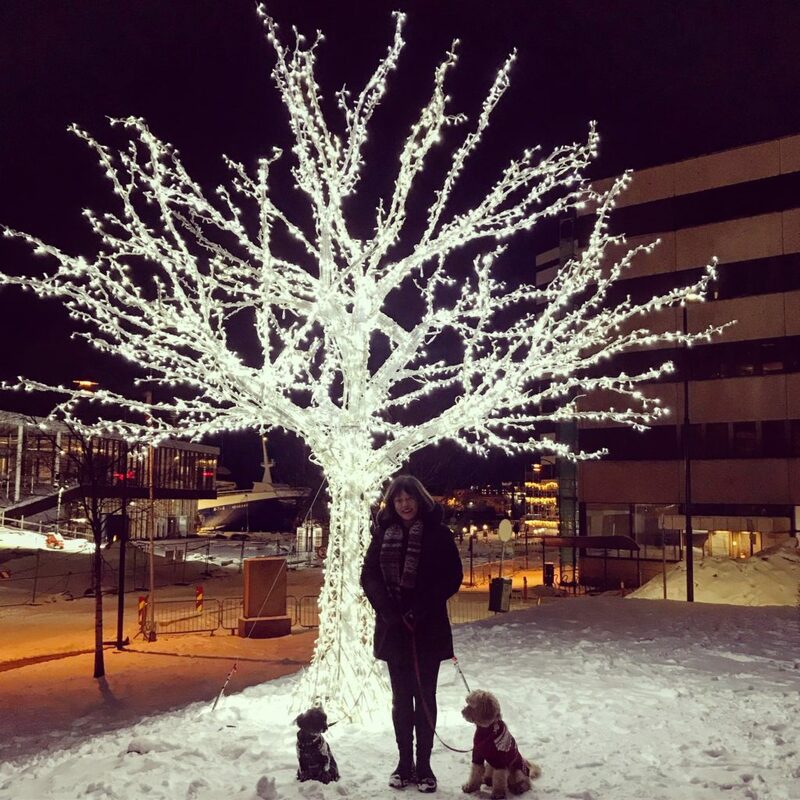 I loved learning about Norway, it’s not on my bucket list, but I enjoyed your descriptions. Germany is somewhere we are thinking about, just not quite sure. We only speak one language, our native English/American, was not speaking the language ever an issue? 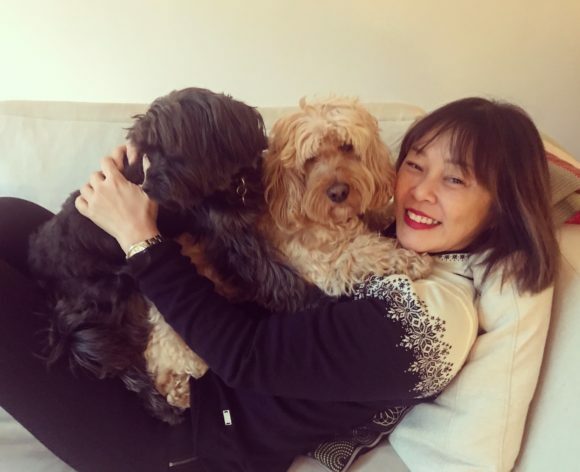 Though I think everyone speaks the language of cute dogs! I’m so glad you are home safe and sound and snuggling in your own bed. I can relax now. You see I was worried something was going to happen on all your adventures, but I’m so glad it never did! I look forward to your everyday blog posts about your everyday outings in and around London! Just an amazing journey with two fur babies and BIG wheelie! 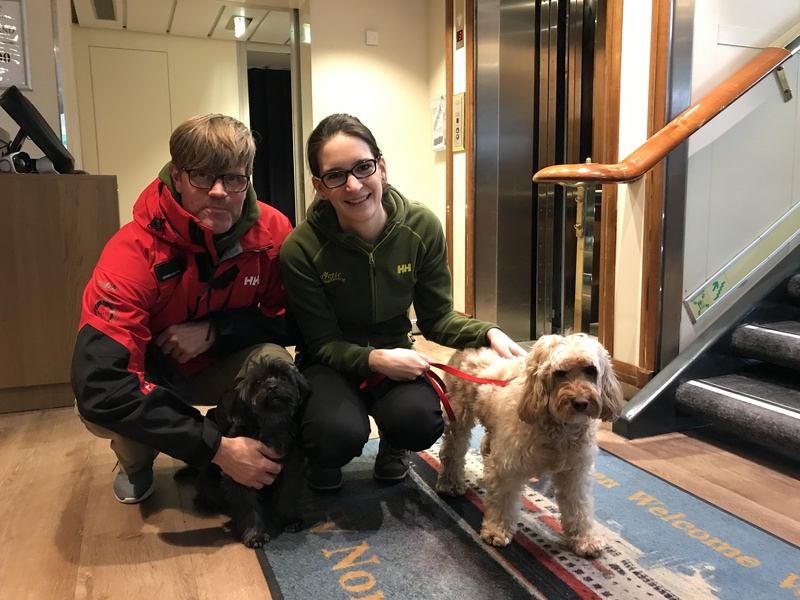 It’s not easy finding dog friendly hotels (unless you’re in France) and how you co-ordinated the trains is just brilliant. What good pups they were! Glad you’re all home safe and sound. Thank you for sharing and look forward to reading about your next adventure. I have loved the blog and gorgeous photos. I think it’s fantastic that you manage to take the dogs everywhere with you on your exciting journeys. It’s been awesome following in your footsteps May…can’t wait for the next adventure. What an amazing journey! Thank You so much for sharing it. May, Darcy and George your blogs make me feel like I am experiencing everything with you! I have loved reading everything. I look forward everyday to reading about your life. Thank you so much for letting us experience them with you! Btw, I have a rescued Maltipoo. We adopted each other two years ago. It’s not difficult – just got to put your mind to it. 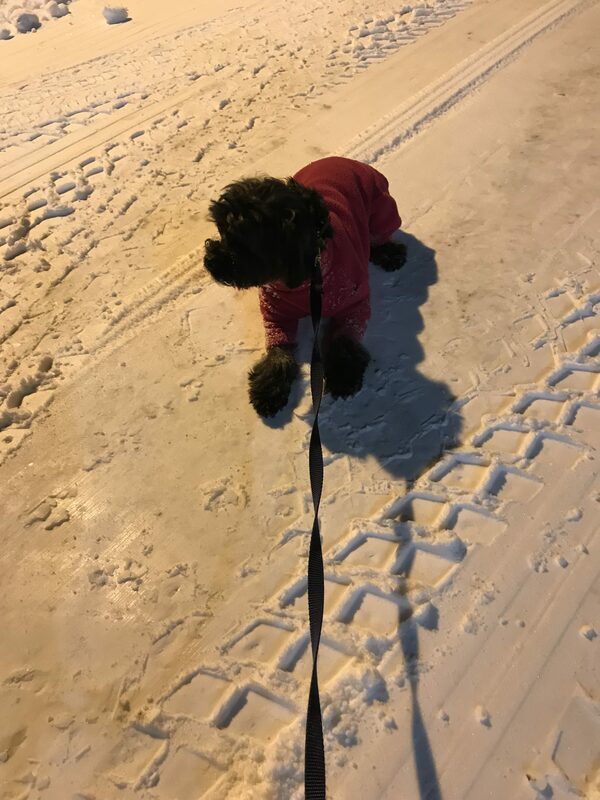 Thank you for sharing your snowy adventure. Most enjoyable. Happy New Year to you and yours.